Global Warming is an issue that affects all of us. Some of us, it affects right now with heavier storms, severe draughts, melting ice and rising sea levels. Some who live in an area that’s mostly surrounded by mountains, we don’t feel it as much, yet. Still, it’s an issue everyone is affected by. We as consumers can do our part in helping our planet. In this post I want to show you 5 easy (and pretty cheap) ways to reduce plastic waste significantly and help the environment. 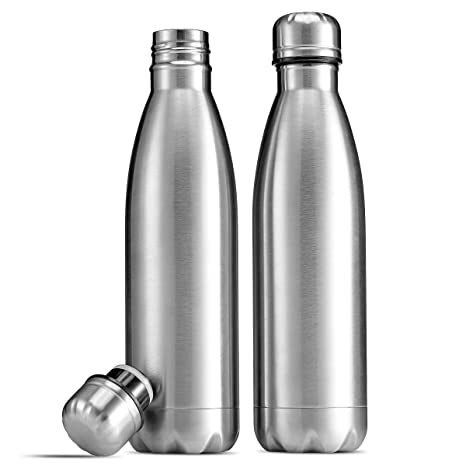 Get yourself a stainless steel water bottle. Here, the only thing that you have to think about is whether the lid is made of steel as well and how big your bottle needs to be to fit your needs. I have one that holds 500ml and that works perfectly for me. Get a plastic free bento with reusable cutlery for when you’re out and about. I have a wheat based bento and wheat based cutlery. But there’s also steel, bamboo and some other more creative materials to choose from. Get a reusable straw. Those are mostly made of bamboo or steel as far as I know. You can get them really cheap or really expensive, depending on the brand. If you’re unsure, I’d suggest buying a cheaper one to see i fit works for you. Some companies sell the straws with little boxes so it’s easier to carry them around. Get yourself a plastic free coffee cup to go. My favorites are those that have two walls. I personally don’t have a coffee cup because I got myself smaller thermos flasks that can hold about 500ml and I put tea in them or sometimes when I go to Starbucks I let them fill my coffee into my thermos. Try out naked beauty products. There are a ton of shops on Etsy, or online like Lush for example that have a variety of beauty products that don’t have plastic packaging. Some don’t even need any packaging at all. I personally use naked soaps from Lush and smaller Etsy Shops. I also have a naked deodorant bar from Lush and solid shampoo and I’m totally in love with those, too. They’re not only great fort he environment, most of these products are handmade by small businesses, especially on Etsy. Since the Etsy fees went up, one of my favorite shops isn’t on Etsy anymore, like so many. But I do want to share their link because they’re great. I do not get any benefits from linking to them. One of them is Lunar Bazaar, Grace and Honey I can really recommend doesn’t have many naked products, but it’s all handmade and as far as I know they’re switching to plastic free packaging as well. I hope this helped you get some basic ideas on how you can reduce plastic, espepecially when you’re out in town or away travelling. 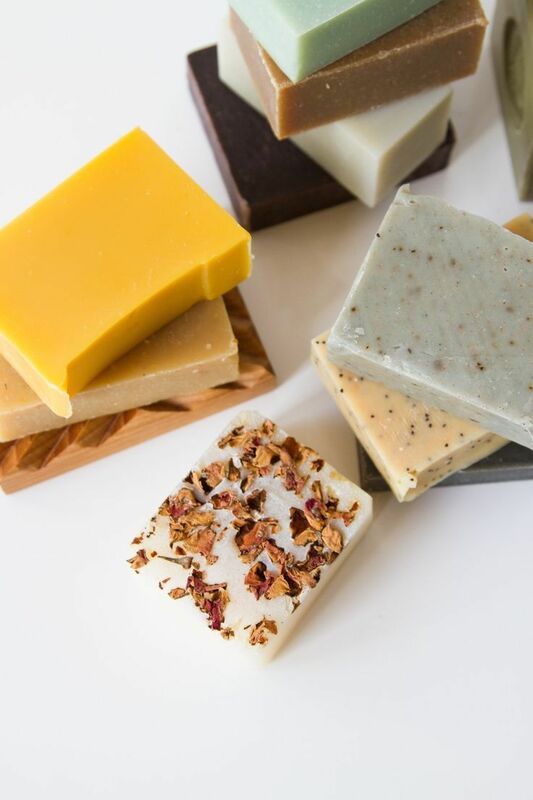 What are your favorite plastic-free products? Share them in the comments! Thanks to Jenny in Neverland for doing this awesome post that inspired me to respond with my own twist on the 10 Year Challenge. The last ten years have been a roller-coaster ride for me. I just turned 25 so if I’m honest, I don’t know anymore what kind of problems my 15 year-old self had. What I do know is that to say that the years that came after were a mixed bag is a huge understatement. For a very long time, I was struggling with depression and anxiety. I’ve overcome quite a lot of obstacles and I’m not sure I will ever be able to leave that part of me behind. I‘ve struggled with mental illness to a degree which made everyday life almost unbearable for at least 6 of those 10 years . But I’ve also had huge upsides during that time that my 15-year-old self could have never imagined. I overcame some of my insecurities and started studying American Studies, which I love (I’m currently writing my thesis). I started my own business and I’ve maintained a healthy partnership for almost 5 of those years. I’ve had the courage to stop seeing people who were making me miserable, and through that, I was not only able to see that I was capable of having meaningful and healthy relationships with other people and that I deserved and needed to realize that I am worth something no matter how much I fail at a something. The biggest thing I probably learned in the last 10 years is this: it’s all about your mindset. The worst situation won’t be half as bad if you don’T roll around in your negative feelings and instead focus on manageable and healthy solutions. The second thing is this: don’t be too proud to seek help, but let yourself be the one who decides for you. What are the things that you’re proud of that you accomplished in the last 10 years? Let’s chat about our experiences! King of Scars was a very anticipated release for me this year, so I have really mixed feelings about this review. I’ve been buddy reading King of Scars with a friend of mine and we both barely finished to read the book within a month or so. We started on a weekend and we’re halfway through but then we both got busy and the book was neglected. The question is, though:why? Maybe I really was too busy to read at the time, but I honestly feel as though the book just wasn’t it for me. At some point, I was more interested in the side characters than in the main plot and that rarely happens. It was well-written and fun to read. There were a lot of funny or insightful moments I enjoyed a lot. As always with Leigh Bardugo, there’s a bit romance sprinkled into the plot and even though th ecouple wasn’t one I was expecting, I still enjoyed that aspect of King of Scars as well. However, the main plot wasn’t gripping enough for me, at least not enough to keep me reading. When I went to bed, instead of reading King of Scars I found excuses and read fan fiction instead. I think it must have been the mix of a busy month and the fact that I liked the side story more than the main plot was probably the reason why it too me ages to finish this book. I will probably read the second part regardless, because I love Ravka. It is like a constantly hungry child that needs feeding and I’m very much the same type of child. I’m not finished with the Grishaverse, yet. I would especially love to read a book about the Darkling, too! How did you like King of Scars? Do you have a favorite character in the Grishaverse you’d like to read more about? Too busy to take care of yourself? Here’s how you can change that! We all know how hard it can be to take a few minutes of our days to do something we really enjoy, especially when we’re busy and our mind is all over the place. At least, that’s how I feel a lot these days. However, there is a simple way to spend more time on things that make you feel better, make you healthy and happy. My solution to this is to wake up one hour earlier. Before I started tackling the self-care topic, I usually got up at around 7am and then spent 10 to 15 minutes in bed or on my phone, sometimes I woke up early to wash my hair, but that was it. Now, I wake up at 6:00am, or even 5:30 am and spend that hour doing things I love. I paint, I bullet journal, I drink coffee in peace, make a tasty smoothie, practice yoga or go for a walk. It doesn’t matter whether you want to have a kick-start or a smooth start in the day. As long as you do something you love, the day will be so much better! Also, you have more time in which you don’t have to feel guilty for not working on some thing or other. The big problem for me was that whenever I read, painted or just chilled on Netflix, I usually felt really bad about it because I’m always busy and have deadlines. But, if I wake up earlier, then nobody can bother me on the phone, on social media or via email. Nobody needs me, nobody waits for my response. It’s true “Me Time” like I simply can’t have in the evenings, even if I don’t work until late. How do you manage to make time for yourself and your hobbies? When do you wake up in the morning`Let’s Chat in the comments! Author RibbonReviewsPosted on 1. April 2019 1. 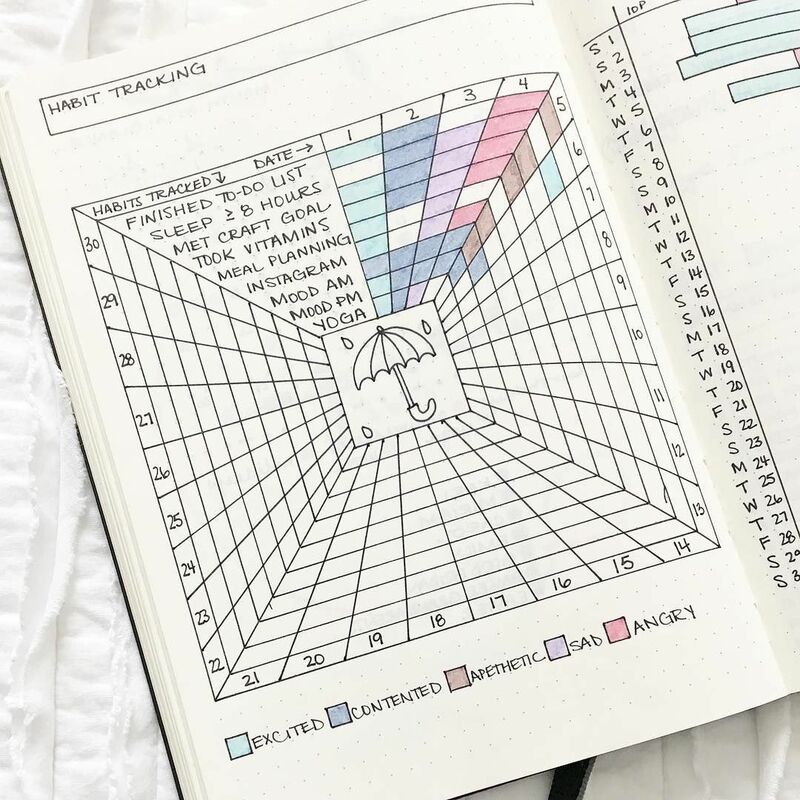 April 2019 Categories bullet journal, Creativity & Productivity, Self-CareTags creative, creativity, morning, morning routine, motivation, productivityLeave a comment on Too busy to take care of yourself? Here’s how you can change that! We all have goals and resolutions we want to stick to. Be it losing a bit of weight, eat healthier or organize better. If you’re like me, then you know that struggle is real, especially when you’re busy. Obviously, having great resolutions is only part of the deal. But actually sticking to them and turning resolutions into habits is the tough part. My Bullet Journal is really helping me to stay focused on resolutions I have set myself. It’s actually quite easy, if you use a habit tracker. Throughout the month, I keep track of my resolutions and accomplishments with a (habit) tracker. You can design it however you like, it should just show whether you stuck to your own goals on each day of the month. Since I’m just starting out and I want to keep it simple, my goals last month were to wake up each day at 6 am and drink enough water (at least 2 liters). I used a simple chart to keep track of how much I drank, when I wake up and a few other small things. It works so great because when you don’t follow your own resolutions, you do get frustrated when you have to leave a day blank, or mark a goal as ‘not accomplished’. Seeing that every day when you write in your Bullet Journal can give you a motivational boost to do better every single day of the week! 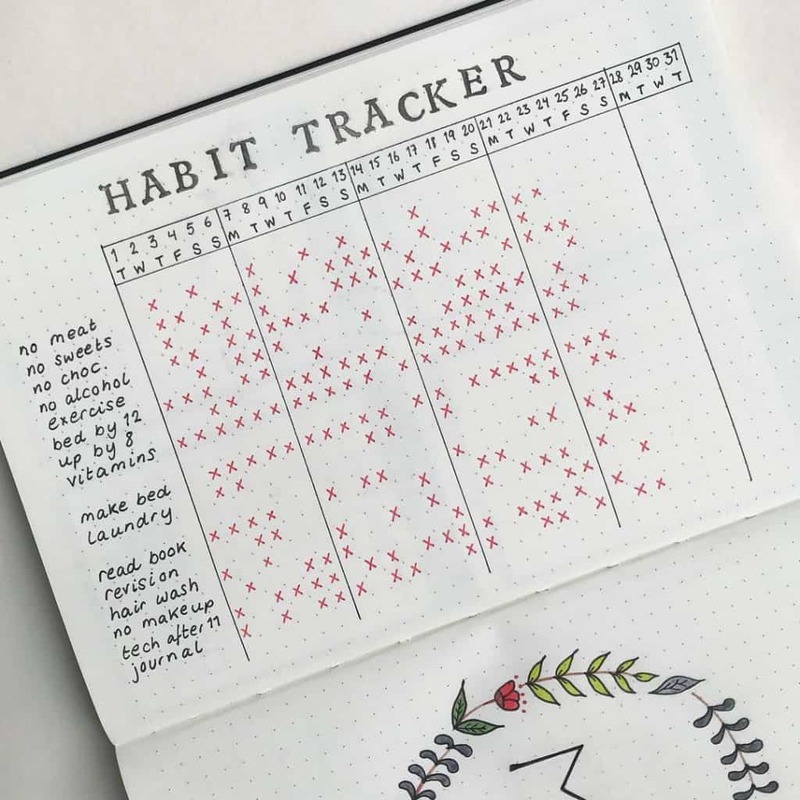 Do you have a habit tracker? What do you do to keep yourself motivated to work on your resolutions? Let’s chat in the comments! I started the Journal to appreciate myself more and get more confident. I don’t know if you struggle with this, but I certainly do. More often than not, I’m too negative and self-conscious about myself, my work and my social life. I tend to over think and end up being a total, disorganized mess. 😀 So when I learned about Bullet Journaling, I decided to give it a go and make sure to use it to appreciate the little things and highlight positive moments, my accomplishments and goals, and be a bit creative. This is what it looks like so far. My first page and the table of contents are basically just the necessities. Really interesting for me personally was the first Goal Page. Even though I started in March, I wanted to set some goals with things I wanted to do/achieve in 2019. Some of those were to finish my bachelor thesis, paint more and to take better care of myself. The next page is really important to me as well. It features my daily morning routine – the ideal one, at least. As monthly goal, I’ve set myself the task of coming as close as I can to that routine. I love to take a walk right after I’ve woken up and do something in the morning that grounds me and keeps me motivated throughout the day. Another page I was really excited about was my habit tracker and sleeping log. As my perfect morning routine starts at 6 a.m., the sleeping log was a great motivation to actually keep rising so early! I even managed to wake up at around 6 every day except for once ( was out the night before hehe) and I’m really proud of that. The habit tracker is really great and keeps me motivated. It’s so satisfying to put that little dot on the day I did something that’s important to me. I made that photo quite early so there isn’t much there, yet. By now it’s much fuller and it’s still a lot of fun! As you can see, the whole theme kind of revolves around night skies, stars and clouds. I do most of the coloring with water colors or water color pencils and fine liners. The clouds I make at the end with my white Uniball gel liner. I really love that pen as you can’t see through it, even when the colors underneath are really dark! Lastly, I want to share my March spread with you. I chose a sun because it reminded me of a fresh start. I used water colors to paint it and then drew some lines with my pen for more contrast after it was dry. I love Tolkien and his work so much, I really had to include that quote on the first spread. It says “In the end, it’s only a passing thing this shadow. [A new day will come.] And when the sun shines it will shine out the clearer”. It captured exactly my feelings when I first started with this journal. What theme do you have in March? 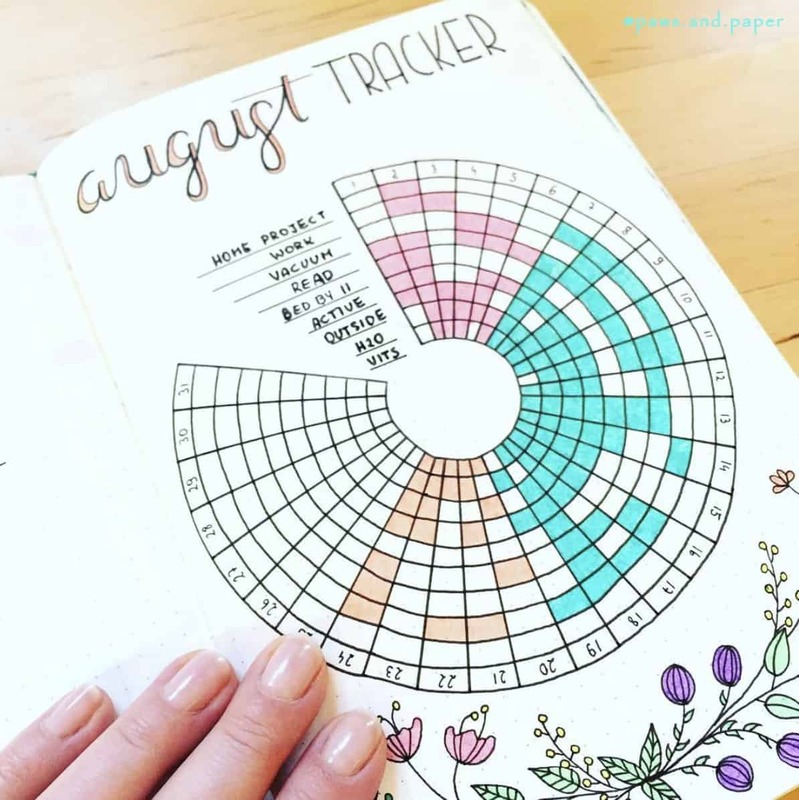 What kind of things do you keep track of with your habit tracker? Let’s chat in the comments! Creativity and Self-Care, Here I Come! I’b back and I’ve decided to not only focus on books on this blog. I’ve changed so much in the past year or so, it just wouldn’t do the blog, or me any good to only write about books. I want to talk more about popular culture, self-care and the environment and I want y’all to be part of that. I’ve created a section called Self-Care and Creativity in which I’ll be posting exactly that. How to be creative when it comes to daily tasks, bullet journaling, writing and other stuff. This blog is called Ribbon Reviews, so you will see reviews of products, books and everything else I use and try out. You can see my first post on Bullet Journaling here. The other new section is called What’sUp and will be for all things pop culture, social and environmental issues and things to talk about. My first post is about privilege, You can read it here. Author RibbonReviewsPosted on 22. March 2019 16. March 2019 Categories Creativity & Productivity, Self-CareTags bullet journal, confidence, creativity, motivation, new start, selfcareLeave a comment on Creativity and Self-Care, Here I Come!